Irma is the lucky winner with comment #5! Congratulations Irma! March is Travel Portland's annual Portland Dining Month with $33 unique 3-course meals offered nightly at 100-plus participating Portland restaurants. Travel Portland started Portland Dining Month in 2009 as a way to promote overnight travel to our fair city. Some of the many Portland restaurants that I love that are participating this year include Andina, Autentica, Biwa, Davenport, Departure, Kachka, Ken's Artisan Pizza, Little Bird, Ned Ludd, Olympia Oyster Bar, Radar, Trifecta, Xico and so many more. New this year, Feastly Portland has joined Travel Portland’s lineup. The pop-up dining experience will feature 21 top chefs from around the world in to-be-released locations around the city. The focus this year is on ethnic cuisine including Ethiopian, Pilipino, Turkish, Puerto Rican and Nigerian dishes. Find out more at eatfeastly.com. I have two gift cards -- one for Ataula and 1 for Ray -- that each entitle the bearer to a 3-course Portland Dining month dinner this March. All you need to do to be entered for this drawing to win BOTH cards is leave a comment here about some sort of food or drink (or food adventure) that you've had in another city in the US or abroad that you'd love to see in Portland. OR you can comment about something like this that you've never experienced firsthand but have dreamed of and would like to see here. I'm writing down a number now and will snap a photo of it. That numbered commenter will be announced at the end of next week and then I'll mail out the cards. 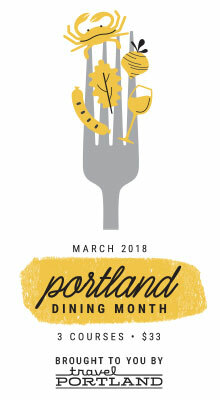 Whether you win or not I highly encourage you to make your reservations for Portland Dining Month via portlanddiningmonth.com. Travel Portland has partnered up with OpenTable and a donation will be made to Oregon Food Bank's hunger-relief efforts for every reservation booked through the website. Please share this any way you can/want. Thank you!